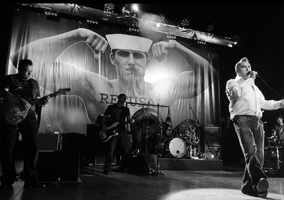 Morrissey kicked off the tour promoting his newest album "Years Of Refusal" by doing something he had never done before, giving a free concert specifically for broadcast on BBC Radio 2. The show was a great success. Morrissey was on top form and so were his musicians. The set featured eight songs from the newest album, including two that had never been done before: "Black Cloud" and "I'm OK By Myself". As Morrissey was also promoting the upcoming redesigned and remastered edition of "Southpaw Grammar", he also added to the set "Reader Meet Author" and "Best Friend On The Payroll". The latter number had never been played in front of an audience before. However, what many fans noticed in the setlist was the live solo debut of two songs from the Smiths days: "This Charming Man" and "I Keep Mine Hidden". The former had been played live extensively by the Smiths, but the latter, being a posthumous release, had never been done live with or without Morrissey's old band. The rest of the set consisted of live staples from Morrissey's back catalogue. After an introduction by BBC DJ Mark Radcliffe, Morrissey and his band entered the stage and the singer greeted the audience with the line "Welcome to our soirée... you're being watched... so am I..." `Following set opener "Something Is Squeezing My Skull" he asked the audience "More?" Following "Black Cloud" he picked up a copy of his newest LP, showed it to the audience and said "So we're trying to stoke some interest - for at least 8 people - in our new long player which from Monday you can buy in what few remaining record shops... those ghostly, sad little islands... yes these are the dying days... However there are some songs for those who couldn't, shouldn't and mustn't..." The latter bit served as an introduction to the live debut of the Smiths classic "This Charming Man". Following the latter number Morrissey simply added "However, having said all that, life, in all its disgusting glory, goes on..."
Many songs from the newest album had been heavily played live the previous year. As they were new compositions at the time they evolved as the Greatest Hits tour progressed. But on this date they were done very much the way they had been recorded and just released. 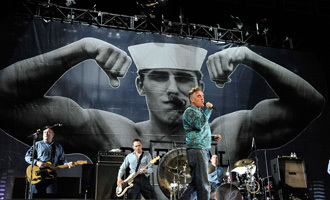 However now and then Morrissey still added his little twist, like when he sang "in the absence of your spotty face" in newest single "I'm Throwing My Arms Around Paris". Following the song Morrissey said about it "...which, as the intelligentsia know, is also a single (fan says something)... Say what? (fan repeats, Morrissey replies) Anywhere except England probably... you know how England look after their own. I mean just read Mojo, Q, (makes disgusted noises)". Following the live debut of "Best Friend On The Payroll" he announced "That song was - just in case any of the middle class amongst you were thinking of hiring your best friend... it doesn't work out..."
Morrissey extended the beginning of "That's How People Grow Up" to "I was wasting my time, trying to fall in love, me!?" After the song he said "Now this really is like 'An Audience With' isn't it? But do I look like Ken Dodd? (someone shouts something, Morrissey says) Thanks..." As an introduction to "The World Is Full Of Crashing Bores" he told the audience "This is live radio so if you'd like to insult a celebrity chef, now is your chance!" He then replied to someone's shouts by asking "Wigan? Wigan? I've heard of it..." Following the latter title the next planned one was introduced with the brief "From 'Years Of Refusal', 'One Day Goodbye Will Be Farewell'..."
"Reader Meet Author" was introduced with the announcement "We're also very pleased because in the first week of April there is a reissue of a cd album that didn't really concern you - it's called 'Southpaw Grammar' (crowd cheers) But did you buy it though? Can you prove it... if you have the receipts... and so on..." After the song Morrissey said "We have to play a bit faster because otherwise we run straight into the archers... we must bow..." Following "Seasick Yet Still Docked" he asked "Did you hear that?" He extended the final line of "I Keep Mine Hidden", which he shouted, to "why don't you use your loaf!" He then asked the crowd "Did you like this?... What now? Oh that's it? This is the final song on (fans shouts no!) - this is from 'Years Of Refusal' - (crowd giggles) there's nothing we can do about it now! (crowd laughs) You should have told me earlier... and it's a powerful message, 'I'm OK By Myself'." Following the latter number Morrissey and the band left the stage. BBC DJ Mark Radcliffe then came on and told the audience that there were two more songs on the setlist that hadn't been played and if the crowd made its appreciation known Morrrissey would come back and finish the set. So after a couple of minutes of cheering and applause Morrissey came back weraing a fresh shirt and did "All You Need Is Me" and "First Of The Gang To Die", the latter introduced as "the housewives favourite". Because this concert was given for radio and not part of a tour, there was no opening band. Because this concert was given for radio and not part of a tour, there was no merchandise being sold. As for regular concert, the show was preceded by a montage of short videos. However it appears Morrissey may have selected only a few videos out of the usual batch because the only footage reported by attendees are film clips of Shocking Blue and the New York Dolls. 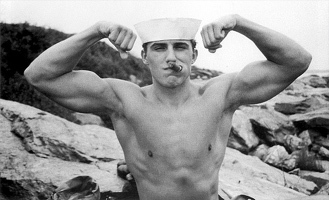 Black and white vintage photo of a sailor with a cigar in the corner of his mouth, flexing his arms. The photo is by Robert Austin Atherton Jr., and may have been taken from a book titled "Uniforms", published by FotoFactory Press. The word 'refusal' was added in black typewriter font over the sailor's chest. View original or in situ 1or in situ 2). Recordings of "This Charming Man", "Best Friend On The Payroll" and "I Keep Mine Hidden" from this concert were released as b-sides on the "Something Is Squeezing My Skull" single, released later that year. This concert was recorded by the BBC and the complete set minus the final two songs was broadcast on BBC Radio 2 FM and video-webcast on Radio 2's webpage as it took place. This first webcast is circulated on the internet, but fans and collectors will likely prefer the DVD put together by a fan which combines the webcast footage with the better sounding FM audio. The show was rebroadcast in audio only on BBC Radio 2 on 18 November 2010. This rebroadcast omitted some of the banter, but included the complete set, including the final two songs which were not broadcast in either video or audio in 2009. The BBC FM broadcast of the complete set minus the final two songs is heavily circulated on bootlegs. At this point in time it actually is the most popular bootleg of the 2009 dates despite the fact that the set was shorter than most regular concerts Morrissey played that year. This FM recording can be found on the manufactured bootleg cd titled "The Charming Man" (paired with 8 songs from 17 December 2006) and the fanmade "Life In All Its Disgusting Glory Goes On". A selection of tracks were included on "Live At The BBC". The audio from the video webcast mentioned above is also circulated on the internet because it was produced before the better FM broadcast came into circulation and still can be found in some people's digital collection. The 2010 broadcast of the complete set in audio has yet to make it on bootlegs.